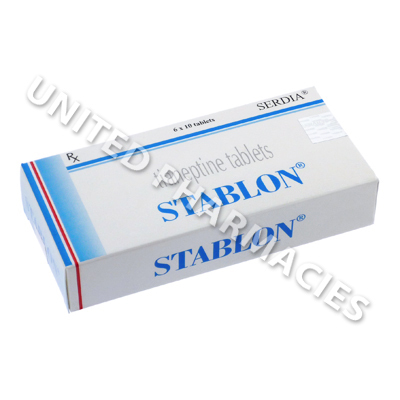 Stablon (Tianeptine) is an antidepressant medicine known as a selective serotonin reuptake enhancer (abbreviated to SSRE). Its mode of action is opposite to that of SSRI antidepressants and it has no anticholinergic effects. Manufacturer : Serdia Pharmaceuticals Ltd.
Stablon (Tianeptine) is an antidepressant medicine known as a selective serotonin reuptake enhancer (abbreviated to SSRE). Its mode of action is opposite to that of SSRI antidepressants and it has no anticholinergic effects. No effects on the patient's alertness or sleep occur as a result of treatment. In addition to treating depression, it is also known for its anxiolytic properties, and is considered suitable by some doctors for use in patients who have previously been affected by alcohol withdrawal. This medicine has been investigated by medical researchers, and a number of studies have taken place. The aim of these studies was to further understand this drug's effects, and to find out what the effects would be if used to treat male patients affected by depression who also have erectile dysfunction, asthma, fibromyalgia, ADHD and irritable bowel syndrome. However, currently, it is indicated for depression. Patients with depression who are being treated with Stablon (Tianeptine) will be provided with an individualised dosage regimen by their doctor, and it is essential that these instructions are adhered to. Adults are generally told to take 12.5mg (equal to one tablet) 3 times per day. The medicine should be taken in the morning, and again at midday with the final dose taken in the evening. Take the tablet at the start of a main meal. Some patients with special considerations may be told to only take 2 tablets per day. For this reason, it is essential to see your doctor before starting treatment, to ensure that a safe dosage can be determined. If any side effects occur while you are taking this medicine, you should inform your doctor. It is also important to note that serious reactions may occur, and if this happens, it will be necessary to see your doctor immediately or to go to the hospital. Patients will most likely be informed by their doctor that if an interruption of treatment is required, it will be necessary to gradually lower the dosage over a specified period of time, usually 7 to 14 days. Any patient with a history of dependence on alcohol or any other substance may need to be closely supervised during treatment. Always use Stablon (Tianeptine) as you have been prescribed by your doctor. Never self-medicate or change your dosage without first consulting your doctor. The correct dosage can vary depending on your health, medical history, and the severity of the condition being treated.